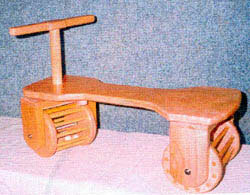 Wooden classic toys are very easy to make. They are also very good sellers at craft shows. Below are a few of the wooden toys that we made and sold. Many of the wood crafts today are much easier to make because of all the tools that are available. To make the toys you really need a scroll saw and a drill or drill press. You can make your toys out of pine but we made them out of maple or ash. They are so much easier to work with when you use a hard wood. They sand very easy and finish with a high sheen. If you use pine then you really need to sand and sand. Also pine is a very soft wood and will show dents and scratches very easily. All you need to do is glue or trace your pattern on the wood and cut out. For the hole in the center of the animals use a forstner bit just a little bigger then the round ball. Drill holes for the wheels and attach a dowel and the wheels. The wheels keep the ball in the animal. Paint the balls different colors so that they are bright. Children love bright colors! Drill a hole in the front of the animal and attach a string and then add a ball to the end. Be sure you finish the toy with a child safe finish. There are a few on the market that are safe. Another wooden classic toy that was a big seller is the town car pictured above. You can get the pattern for it here. We made ours out of maple and the children loved them. They look complicated but they are pretty easy. Just cut the parts out and put it together and you are done. Why not make some for your kids or grandkids. They will spend hours playing with them.